Romancing The Song is a tiny Facebook group of music aficionados of the Hindi film music kind. Its members share their thoughts, usually about specific songs. Here is a representative sampling of what they do. They also meet, in various combinations, several times an year. In a tribute to the legendary music director OP Nayyar, Silhouette presents a unique collection of essays curated by noted musicologist and author Manek Premchand, admin of the RTS group. The group draws its name from Manek’s book Romancing the Song, an in-depth encyclopedic lyrical journey through the history of the Hindi film song. If you are from Mumbai, surely you have seen the Queen’s Necklace, a 4-kilometer curve along the waters of the Arabian Sea. It is probably the only part of the fascinating city that has remained safe from vandalism and urban monstrosities of cement concrete and glass. Those of us who grew up in the ‘40s,‘50s and ‘60s recall how this area also became famous for two stylishly long American cars parked along here, with their owners living nearby: those of singing-actress Suraiya and of music maestro OP Nayyar. Besides their music, they also shared one other thing: the appreciation of the good things that money could buy. He with his Oxford shoes, Fedora hats, YSL cigarettes, Johnny Walker Black Label Scotch, and she with exquisite jewelry and clothes, etc. Destiny did bring them together once in Mr. Lambu (1956), just as she was going down the staircase and he was running on his way up. But what running up? Around this time, he was quickly rushing to the top. Do recall CID (1956) with its Kaheen pe nigaahen kaheen pe nishaana, and Leke pehla pehla pyaar. Do pause to consider Jawaaniyaan ye mast-mast bin piye and Yoon to humne laakh haseen dekhen hain (Tumsa Nahin Dekha, 1957), Maang ke saath tumhaara and Saathi haath badhaana (Naya Daur, 1957). This is, of course, not to overlook Nayyar’s work before these years, in films such as Aar Paar (1954) and Mr. and Mrs. 55 and later in Phagun (1958), Howrah Bridge (1958), and innumerable films with dozens of wonderful tunes. Clearly the young man was creating havoc very fast, until he relentlessly hit the top of the charts, going up, up and away until there was just about nowhere higher to go. Ishaaron ishaaron mein dil dene waale (Kashmir Ki Kali, 1964), both in Pahadi. These are just a microcosm of his songs based on Hindustani classical raags. Can you imagine what he would have done if he had had classical training? Not just that, he had many other tricks to elevate a developing melody into a perfect song. One strategy was to use wonderful instruments and let them stand out. Metaphorically speaking, because he recognized their original worth, he often chose to grate—rather than liquefy—musical instruments in his blueprint, so that each sound could be relished as part of a melodious feast. Example: check out the mandolin at the start of both Kabhi aar kabhi paar (Aar Paar, 1954), and Thandi hawa kaali ghata (Mr. and Mrs. 55), the solo violin that starts Humne to dil ko aap ke qadmon pe rakh diya (Mere Sanam, 1965), the incredibly conceptualized sarangi notes in Aana hai to aa raah mein (Naya Daur, 1957), and so many more such amazing tunes worth their weight in palladium. But OP Nayyar will be remembered most for his ghoda-gaadi songs like Piya piya piya mera jiya pukaare (Baap Re Baap, 1955) and Zara haule haule chalo more saajna (Saawan Ki Ghata, 1966). He will of course be equally remembered for songs featuring his woodwind section, and these too, like the ghoda-gaadi ones, are in big numbers. This woodwind arrangement features a combination of the Oboe, Sax, Clarinet and Flute, and you can hear these instruments going ensemble in varying strengths, in tunes such as Antam phantam chhod de babu (Hum Sab Chor Hain, 1956), Humen koi gham hai (Bhaagam Bhaag, 1956), and Aeji dil par hua aisa jaadu (Mr. & Mrs. 55). Nayyar was an ace at crafting such melodies. In fact he was an ace at whatever he did, in and out of cinema. It doesn’t do him justice when people sometimes refer to him as King of Rhythm. Because when he got going, he was nothing but King of Melody! This ‘got going’ thing went on till Chain se humko kabhi (Pran Jaaye Par Vachan Na Jaaye, 1973), after which his descent commenced. But did he hang up his hat? Nah! He kept at it for decades more, making music for Hindi as well as regional cinema, as well as out of cinema, right through till the end. Having lived a bohemian life, he left his home, wife and four kids, to spend perhaps the last fifteen years of his life with people he had hardly known before, and who, in socio-economic terms, were hardly his equals. He passed away in an obscure home in Thana, a Mumbai suburb, on 28th January, 2007. Now, every time a radio or TV channel plays Nayyar’s songs like say Ai dil hai mushkil jeena yahaan, the royalty is sent to them. After all, they stood by him till the very end. They also have his personal effects like his Fedora hats. But not everyone is fit to wear Nayyar’s hat, or step into his Oxford shoes. They don’t make them like him anymore. Manek Premchand writes a weekly column on Hindi film music, and has authored five books on the subject: Yesterdays’ Melodies Today’s Memories, Musical Moments From Hindi Films, Romancing The Song, Talat Mahmood—The Velvet Voice and Hitting The Right Notes—Hindi Cinema’s Golden Music. Besides these, he has written one third of the book Shiv Kumar Sharma — The Man And His Music. Manek’s focus in that definitive biography of the great santoor maestro is the latter’s contribution to cinema—both as an instrumentalist as well as a composer. There are some songs that I call ‘stand-alone’ songs. They truly belong under no category. By virtue of the thought expressed in them, they transcend mere words to become experiences. Here is one such song from the pen of SH Bihari, put to music by the man with whom he shared a long partnership in the ’60s, himself a trailblazer in Hindi film music – OP Nayyar. With Rafi giving his soulful voice and an expression that defies all description, and a musical score to be envied, the lyrics are what become center-stage. The song starts with a Capella mukhda. If you’re not watching the song, the start of the song gives away a little bit of information. The usee kee is sung with a sweetness, the entire mukhda with a slow contemplative air which can very well be taken as sadness. The minute Rafi sings mohabbat mein you know there’s a drunken element to the song. As the song progresses, however, it seems more the intoxication created by the combination of lyrics and music here, rather than alcohol, so soaked is this song in philosophy. The first two lines are sung softly. In the repeat of the mukhda, the music starts – and how! The bongos, as if waiting for their signal, and as soon as the words are over, the saxophone takes center stage! This is a song known for its spectacular interludes and the postlude, dominated by that sax. Notice the sax doesn’t play during the antaras, almost as if killing the listener with more than one intoxicant at a time had been ruled out by the composer! It could either be the sax or Rafi’s voice soaked in the poetry. The poetry binds you in a spell. Many will tell you, in fact argue, that this comes under the category of sad songs. They may be right. In fact, seen in its cinematic context, that is exactly what it is – a dejected lover drinking and waxing eloquent. However, if you hadn’t seen the movie, had no inkling of the context, and had only the audio to go by, what would this song say to you? How would it speak to you? The three verses paint a vivid picture for me – that of a Sufi, lost in his contemplation of the beloved, for whom nothing exists except the beloved and whose every happiness is linked to merely being in contemplation of the beloved. Do the words Luta jo musafir dil ke safar mein, hai jannat ye duniya uss ki nazar mein sound sad? Bereft of hope? As if he wishes to leave nothing to imagination, the poet follows this up with Ussi ne hai lootaa mazaa zindagi ka. In fact, this ‘traveller’ who seems like he’s been robbed – of his heart and peace of mind – in his journey, is actually the fortunate one! To so contemplate on the image of the beloved that you become an image of the one contemplated upon – Ke jo ban gaya ho tasveer-e-jaana. This surely is love that knows no boundaries and no limits. A love like that surely deserves respect- Karo ehtaraam uss ki deewangi ka; in fact, each one that becomes immersed in a love like this deserves the deepest reverence – Hai sajde ke qaabil har vo deewana. Does this sound sad? Here in the third stanza comes the first mention of a destruction. The word barbaad is used here as the condition of this lover. But the way it’s used, it hints more at a dissolution, rather than a destruction. When you think of the three stanzas together, this stanza becomes even clearer. To immerse oneself so much in the thought, the contemplation of the beloved as to completely lose your identity, to merge oneself with thoughts of the beloved; to think of this state of non-being as the solution, the medicine that is needed for survival – if, in fact, such a state of being can be called a ‘survival’ – Barbaad hona jis ki adaa ho, dard-e-mohabbat, jis ki davaa ho. What sorrow can touch a love such as this? Sataayega kya ghum ussey zindagi ka, mohabbat mein jo ho gaya ho kisi ka. This, then, is not a melancholic song. It’s one of the richest songs in Hindi Film Music. Soaked in deep respect for one whose only thought is the beloved. Everything else ceases to exist. Or, maybe, everything and everywhere becomes an excuse to think about the beloved. Whether a love such as this is reciprocated or not is immaterial, being its own reward. And no one could have conveyed these feelings, this emotion better than Mohammed Rafi, for who, perhaps, singing was its own reward – his true love? Monica Kar has her BA in English Literature from the University of Delhi. She now lives in St. Charles, Missouri, USA, where she wears many hats. While she has worked in Publishing, Retail, Education and Construction in various roles, she has been a free-lance editor for the past 30 years. Two years ago she started writing about her first passion – Hindi film songs of the Golden Age for RTS music group. She welcomes suggestions and critiques on her writing as it makes her learn and grow as a writer. Just listen to the genius of OP Nayyar in the four-stage prelude of this song. First the mandolin, then the woodwind section including the flutes, then the breath-taking sarangi, followed by the whistling. And all these are only the prelude, the singing hasn’t even started! Does anyone need a song from Madhubala to surrender at her feet? I hear the Asha-shyness combined with the Asha-gutsiness, resulting in a song that is a complete marvel to me! It’s for songs like these that I hold that OP Nayyar was no accidental genius. He was destined, in spite of his stunning good looks, not to be an actor (he failed the screen test, thank God) but to be a composer. The prelude of this song in four parts makes me feel this prelude could have offered OP Nayyar with four different melodies for four separate songs. A song in a ghoda-gaadi with the woodwind section going full steam ahead, the song has the Chinese wood-blocks too, but why dissect it? The song is sheer grace in melody. And for women’s libbers, hey! this film is from 1958 and the lady is whistling to get the guy! Does it get better than this? Hasrat Jaipuri excelled here too. This is dangerous stuff for all romantics – deadly stuff! Lata Jagtiani is an author of several books including the biography, OP Nayyar King of Melody. She has been a lecturer both in India and abroad teaching English and Creative Writing to college students. She lives in Mumbai. No, my keyboard is not faulty –this is the essence of this song. It starts with the humming – and you know life will never be the same again! That’s the magic of the OP Nayyar -Rafi team. Rafi’s singing is absolutely, absolutely, absolutely divine. And to think I didn’t like Rafi songs until recently! Don’t miss the OP Nayyar genius at work. The composition seamlessly changes from Indian to western. From the mukhda to the interlude, and the antaras to the interlude – from the tabla to the violins and saxophone, and then a flute when the antara begins. Simply super! SH Bihari’s lyrics present the affect love can have on you. Love- that changes everything about you. Your smile will betray how you feel. It has been 55 years since this song was composed and sung. I can’t believe it’s that old – it’s still like a breath of fresh air. I love everything about this song and I haven’t even started on the video as yet! Surely a song made in heaven. Music-obsessed and tech-savvy Soudamini Bose, originally from Bombay, lives in Shanghai with her husband Ravi and son, Aditya. Her upbringing and young age place her at the listening intersect of music from everywhere, especially old Hindi film music, and lots of the new kind. Music keeps her famous soaring spirits up there! The young man said – I don’t believe in magic. The old man smiled – You will, when you see her. What is love? Love is the bottom line, it makes the world go round and is the be-all and end-all. That, as a young woman, was my notion of romance as I waited impatiently to fall in love. Reading all those romantic novels while growing up had whet my appetite for the tall, dark, handsome stranger who would walk into my life and sweep me off my feet! But even as I built castles in the air, Cupid sat atop a turret and smiled to himself. He had one eye on the celestial clock and one on the arrow that he would release when the time was right. And that’s when love would happen. Period. Rafi’s Oho ho, oho ho, a-ha-ha right away sets the tone for the first flush of romance in a breezy song that wafts on a deewana baadal, as the heart soars with happiness while pyaar takes a delicious angadayi. It is love at first sight amidst toofan, hulchul and shehnayi as Asha sings, tinke ki tarah main beh nikli and the coy Kashmir ki kali is swept off her feet! For me, this is one of the most romantic numbers ever and the credit goes to OP Nayyar for a magnificent melody that just draws you in and takes you afloat the shikara ride with the rakish Shammi and lovely Sharmila. And to Rafi and Asha for their dreamy, dil-phenk rendition – the angadayis in their voices stretching out to touch your heart. Also to SH Bihari for his beautiful lovelorn lyrics that remind you of the first time you fell in love, the magic of that moment, the race of the heartbeat, the spring in your step, the stars in your eyes -who can ever forget that? Not me! I had a tough time picking just one romantic OP Nayyar duet from the list, the others being: Isharon Isharon mein dil lene wale, Zulf ki chhaon mein chehre ka ujala le kar, Bahut shukriya badi meherbani, Tum jo hue mere humsafar, Chand zard zard hai and Humne toh dil ko aapke qadmon pe rakh diya. I absolutely adore OP Nayyar and his honeyed melodies, they make my life that much sweeter. He lived to the ripe old age of 81 (his white ensemble and hat intact) and composed countless amazing tracks for films for a good 45 years. His foot-tapping beats, brilliant use of instrumentation, inclusion of punabiyat; all these brought about a freshness and zing that was unique and truly changed the sound of music. He gave Asha the position she well deserved, pandered to none and became The Boss for all the right reasons! As the story goes, OP Nayyar apparently operated on his own terms and Kashmir ki Kali is a case in example. Shakti Samanta came to him with a concept for a film where he requested 8 compositions of different moods around which he would wrap a story. OP Nayyar agreed and delivered and each song was a hit! His sole condition was that he have a say in the picturisation of the songs and (I think) he got his way. He became the only music director to be often signed up for a film before the hero-heroine, and his name would supersede theirs on the billboard. Enjoy this melodious number as you recall your pehla pyaar and I await my “sachha pyaar” because Cupid’s arrow is about to strike! Madhur Trivedi is a homemaker who went to school and college in Delhi, where she still lives. She is a fine painter and writer. And a cerebral person, as well as a die-hard music buff. Piglet asks Pooh – How do you spell love? Pooh says – You don’t spell love, you feel it. I got this quote from a friend of mine on WhatsApp some days ago and how true the words are! More so in the case of Guru Dutt’s films. His films are pathos-driven most of the time but they also make their way to the top 10 of the most romantic films. Potent romance. You feel those vibes from the screen to you. And all this when not a single romantic line is uttered between the people in love. No flowers exchanged, no running around the trees, no sweet-nothings whispered. But yes, there certainly is a cupid present. His songs! That cupid certainly says love is in the air and you’ve got to feel that love. Songs are his way of expressing repressed feelings. Those songs often are about unfulfilled love. What better way to show it on screen than someone else singing and revealing those feelings to the audience! And the panjandrum needs only a dholak and a harmonium to make it achingly romantic. Making us inebriate with Rafi’s voice going, Kaise aata hosh mein jo pehle hi behosh tha. With only the beats of the dholak and the claps – just that – and it makes the song so scrumptious. With the lyrics echoing Guru Dutt’s muted feelings, for he has just agreed to divorce his beautiful wife, Madhubala, when he’s head over heels in love with her. Wantonly ruining his love life. Main sharab-e- ishq se madhosh tha…..how deliberate! In the visuals, Guru Dutt standing by the lamp post, a cigarette in his mouth, sometimes coming out of the shadows, sometimes merging with them. Feel the emotions on his face. Those emotions are also playing hide and seek with him and us at the same time, where shadows are longer than your own self. Ditto with the lyrics and music. Hide and seek of those dominant lyrics in the light, forming longer shadows of delectable music on us, sometimes out of it, sometimes merging with it. Deepa Buty lives in Nagpur, and writes beautifully. This is what her Facebook page says about her: “(She) Loves Dev Anand and music. Not sure in which order!” She is also a founder and admin of the music site SongPedia. Dhake ki malmal is not only the name of a movie, but quite a famous textile. Lately, quite the craze in North America, by the name, muslin..
O P Nayar’s music was always alive, prompting one to dance; if not to dance, at least to tap toes or to beat the rhythm on one’s thighs. The music was so rich and crafted so well to the lyrics, one didn’t have to watch a video; one could imagine in the mind’s eye how the song would be presented. Undoubtedly, many stars had their stars polished with an illuminating shine… once OP Nayyar orchestrated a representation for them. There are so many examples where the song fashioned the fate of the stars. Peppy numbers that reigned in our growing-up period remain with us for the rest of our lives, they remain in our tissues. Songs of inspiration bring a new warmth in our nationalistic blood, often when the nation is under siege. Naughty songs have their own place to re-configure our psyches. Even the sad numbers of OPN haunt us perennially. I had to resort to some song-crunching in my head, and heart. Here, I post a song that has so much beauty depicting the depth of solitude and pain felt by the absence of a sweetheart. Simple words penned by Mrs. Saroj Mohini Nayyar were woven by OP Nayyar for CH Atma to sing in his baritone voice. Softly, ever so softly. The music composed by OP Nayyar for this song was so well chosen, not sure if it is the strains of a violin or a sarangi. Both of these are the best instruments that can cry at the same pitch that a distressed human cries -deeply with a choke that dare not escape the lips. Sneh Dhingra (nee Khanna) was born in Delhi to an Army Officer father; consequently, she spent time in several cities, going to school at Patna, graduating in Physics major from Meerut, and also living in Delhi, Lucknow and Kanpur before migrating to Canada, where she has lived since 1975. She is currently based in Ottawa. First, an anecdotal confession. This song, the body of which I cut into snippets, and inserted in various essays, was the matrix on which I managed to bag 206/250 in my pre-degree exam, a hither-to unheard of phenomenon in our college. Needless to say, the Hindi Department of our college went ga-ga over me! Rafi Saheb was at ease in any situation, be it romance, philosophy, sad songs, bhajans or inspirational songs. Name it and he would guarantee justice to any musical genre. This song, in its tune and orchestral texture, oozes romance from every pore. Add to it the exaggerated histrionics of Shammi Kapoor, and the label of “Romance” need not be stuck, for the discerning listeners. The lilt of the modified Calypso style orchestrated by OP Nayyar, enters our souls, stirring us to dance along with Shammi. Let’s enjoy the romantic side of Rafi Saheb. Dr. Pisharoty Chandran is a Psychiatrist based in Thrissur, Kerala. He is also a gifted singer, besides being a talented photographer. His compositions are remarkable for their exuberance and natural buoyancy. The energy and verve of his native Punjab is so replete in his songs, (of course he scored equally evocative sad songs too) and you can’t sit and listen to them in peace. You would have to start nodding your head or tapping your foot and attract curious side glances from people around you. So read the risk factors of listening to OP Nayyar’s music before putting on those earplugs. Interestingly, I find some of my most favourite OP Nayyar songs are on some vehicle or the other. He perfected the “tonga” song no doubt – Yeh kya kar daala tune, Phir Wohi Dil Laaya Hoon, Maang ke saath tumhara, Piya piya piya mera jiya pukaare, Yeh hai Bambai meri jaan. But shikaaras– those marvelous Kashmir ki Kali songs; cycles – Pukarta chala hoon main and many more; trains – Badal jaaye agar maali) and convertibles are not far behind either. OP Nayyar can transport you to Kashmir ki vaadiyan and those hilly roads lined by towering pines with cycle pe ladkiyan in minutes with his music. The hero will be in a convertible or a shikaara or a tonga with a guitar perched on his shoulder –Laakhon hai nigaahon mein. Or even a harmonium would do – think bahut shukriya badi meherbani. The heroine would be coy and shy or supposedly angry at the hero’s flirtatious wooing- Yeh chaand sa roshan chehra. Either way, she cannot resist his charm – the music is such, who can! Or on the flip side, if the hero is trying to put up an act of disinterest – the heroine will be chasing him with the most melodious music- Jaayiye aap kahaan jayenge. Result – the hero or the heroine can wait to be wooed but the audience is already floored! Well, now you’ve got to leave the hills and the moors behind and return to the city. OP Nayyar gives you the best urbane entertainment you can think of in delightful, frothy club songs – Aaiyye meherbaan and Babuji dheere chalna would be among the top club songs list always. Among the very few dance duels picturised as club songs Huzurewala, jo ho ijazzat to hum ye saare jahan se keh dein between Helen and Madhumati with Manohar Deepak is surely one of the best known. The song gets a sensational start with the Spanish guitar and the saxophone while the verve-laden voices of Asha Bhosle and Meenu Purushottam perfectly match the energy of the dancers. Love songs? Aplenty, aplenty. From the frothy Tumsa nahin dekha to the soulful Aapke haseen rukh pe, the sentimental Yahi woh jagah hai to the romantic Aankhon hi aankhon mein ishara ho gaya. I have to mention that haunting song, that touches my soul with its deep hurt, anguish and pain – Chain se humko kabhi aapne jeene na diya. 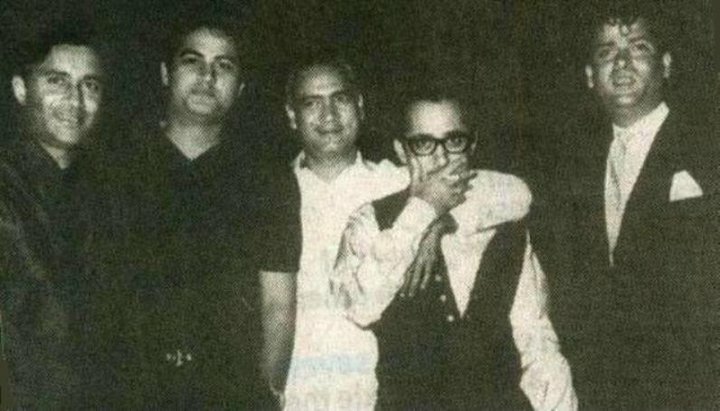 OP Nayyar’s love songs topped the charts and hit bull’s eye with the audiences. After the lukewarm response to Baaz, Aar Paar happened and there was no turning back. There are duels and there are battles. But for me the most engrossing duel is this electrifying dance sequence by the sisters, Ragini and Padmini. For me actresses from the South mean mesmerizing dances with the most amazing expressions from oh…those large dark eyes!! And this song emphatically puts together all that – just look at those mudras and the flashing eyes that go in perfect harmony with the astounding rendition by Rafi and Manna Dey. Now this is something intrinsic to Indian classical dance – men sing, women dance! And what better way to present it than this dance that picks pace gradually and climbs to a crescendo, reaching a frenetic zenith where the two dancers are matched eye to eye till one is flung to the ground. But even in the defeat is a mutual respect for the other’s expertise. Wish all duels ended this way with the two competitors appreciating each other’s control over their craft. I believe Lord Shiva would have been impressed at this flawless tandava. Manek Premchand’s essay published in this collection was first published in his Sunday column in DNA, Jaipur and then in his book Hitting the Right Notes. Grateful acknowledgements to Monica Kar for editorial support. Lovely compilation on the genius composer OP Nayyar’s death anniversary. I am sure he is on Cloud 9 today hearing us go into rhapsodies about his musical scores! Lata Ma’am, all thanks to Manek Sir for compiling the essays. Awesome “Rhapsodies” they are! I believe as you and Lata Ma’am said, we must have made the music legend OP Nayyar very happy. Kudos to you, Manek for this extremely enlightening essay about OPN & inputs by his admirers! Manek, what a wonderful job you did. In this time and age when one is often short of time to explore different locations, you put it all under “one roof” so to way. And each write up as good if not better than the other!!! Hence, will not say which one I liked best. The fact of the matter is that I liked them all. I don’t know if it was fated or there was a misplacement of starts that day, but what if OPN and Rafi had not parted ways on that fateful day…for something as not keeping time. And that too in a country like India and the times we were in – no cellphones, inadequate transport options etc all. That question, what if, haunts me to this day. Absolutely marvellous. 5 of the best writers write and a 6th one puts them together including her own ………what a wonderful of unbridled cooperation love and harmony. After reading the write-ups above, being an ardent fan of O.P. Nayyar Saheb, I must express my gratitude to all those wonderful writers who have so well brought out the various facets of OP’s compositions. I do not think there is anything more to be written about this real ‘Emperor of Hindi Film Music’. Thanks a lot. I have been searching the name of artist who plays saxophone in the song ‘yeh duniya usiki zamana usika‘ of KASHMIR KI KALI on screen. Can anyone enlighten me? The great Saxophonist, Manohari Singh himself!! !